Are you the individual getting married, or someone hosting a wedding or reception? This is the option for you. Are you a vendor, performer, caterer or entertainer who has been hired for a wedding? This option is for you. Policy can include general liability coverage, host liquor liability coverage, and coverage for cancellation, lost deposits, damage to wedding attire, photography, gifts, jewelry and more! General liability, host liquor liability, medical expenses and damage to rented property. See if you are a fit for our competitive pricing. 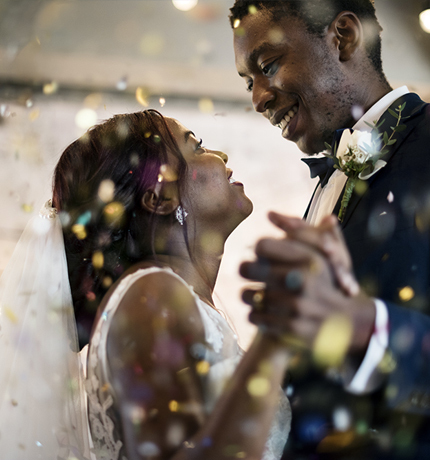 This coverage can provide protection for wedding hosts or service providers if someone trips and falls or is otherwise injured at the wedding. It can also provide protection if you hold the event on someone else’s premises and you or one of your guests damages their property during the event. If someone is drinking at the wedding and injures someone while driving home, the host or the alcohol service provider could be held liable. This coverage can offer protection for a potential lawsuit against you for negligent service of alcohol. If a guest gets injured during the wedding, this coverage can provide reasonable medical expenses for each guest who is injured. This coverage can provide protection against financial loss that may result from the cancellation of your event. For instance, if the reception venue goes out of business, severe weather forces the wedding to be cancelled or the father of the bride has a heart attack. This coverage can provide protection if a booked venue or vendor falls through and deposits have already been paid in full; for instance, if the DJ or hair stylist does not show up on the wedding day. This coverage can provide protection for wedding attire that is damaged; for instance, if the bride’s gown gets torn on the day of the wedding. This coverage can provide protection if something goes wrong with your photography or videography; for instance, if your photographer does not show up, your pictures are damaged or you receive no photographs after your wedding. This coverage can provide protection if your wedding gifts are stolen on the day of wedding. This coverage can provide protection if special jewelry is damaged or lost on the day of the wedding.